The Former Agents of the FBI Foundation, the FBI Agents Association, and the Congressional Medal of Honor Foundation (CMOHF) are proud to announce that two Tennessee students are the recipients of the first FBI Character Development Awards. The FBI Foundation is the charitable arm of the Society of Former Special Agents of the FBI (SFSAFBI). The 2014 awards mark the first time that the SFSAFBI and the FBIAA have come together to honor students who have participated in the CMOHF Character Development Program. 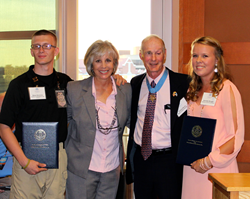 The awards were presented on September 9th in Knoxville, Tennessee, by Medal of Honor recipient and retired FBI Special Agent Thomas R. “Tommy” Norris (LT USNR – RET) to Blake Simmons of Nashville and Kennedy Morgan of Jefferson City as part of the 2014 Medal of Honor Convention. Each student received a cash award of $2,500 to further his or her post high school pursuits. Simmons represents Stratford STEM Magnet High School and was nominated by his teacher, retired FBI Agent Jon Stephens. Morgan represents Jefferson County High School and was nominated by her teacher, Misti Gray. In order to be considered, students were required to participate in the CMOHF Character Development Program. The core values embodied in the program are courage, integrity, commitment, sacrifice, citizenship, and patriotism, and recipients were selected based on their exceptional actions to represent these values. The awards were developed to acknowledge the shared values of the military and law enforcement in support of our nation, as exemplified by Norris’s service in the U.S. Navy and in the FBI. Lt. Norris was awarded the Medal of Honor for his heroic actions in 1972 to rescue two downed Air Force officers while serving as a SEAL Advisor in Vietnam. Later he suffered life threatening injuries in another operation and was medically retired. He was granted a waiver to apply to be an FBI Agent, and, after meeting the same requirements as other Agents, he went on to have a distinguished career in the FBI. Over the years, both the Foundation of Former Agents of the FBI and the FBIAA have provided hundreds of thousands of dollars in educational scholarships to deserving students. The Society of Former Special Agents of the FBI (SFSAFBI) is a professional and fraternal organization of approximately 8,500 members who served with honor as Special Agents of the FBI. The Society was founded 77 years ago and is the largest association created specifically for former federal law enforcement officials. The FBI Agents Association (FBIAA) is an organization dedicated to providing support and advocacy to active and retired Special Agents of the Federal Bureau of Investigation. Our membership includes more than 12,000 active and retired FBI Special Agents. The pillars of the organization include internal advocacy, legal representation, legislative lobbying, and financial support to agents, offered through both the Memorial College Education Fund and Membership Assistance Fund.